Toulouse Lautrec moved to Paris in 1884, renting a flat at 19 bis rue Fontaine in Montmartre, close to Degas' studio. In 1886 he moved to 27 rue Caulaincourt where he remained until 1897. Letters to his father reveal the conflict between his attraction to la vie bohème and his parents desire to have their son live in one of Paris's chic quarters such as the Champs-Elysées or near the Arc de Triomphe. In Montmartre there was not only the atelier of his teacher Cormon, whose students included Van Gogh, Emile Bernard and Louis Anquetin, but the café-concerts that would become the trademark of Lautrec's oeuvre. During this period, Lautrec frequented the famous cabarets Le Chat Noir, Le Mirliton (opened by Aristide Bruant in 1885) and the dance hall Elysée Montmartre. Lautrec's first illustration project was for an edition of poems by Victor Hugo in 1884. In 1886, his drawings were published in the Courrier Français, in the Revue Mirliton, Paris Ilustre and Le Rire. By contributing drawings as illustration to these widely published revues Lautrec was establishing his reputation and earning a living, profiting from the huge expansion in circulation and the demand for newspapers from an increasingly literate public. As for the café-concert in France, 1890 through 1900 were the golden years, with over 200 such establishments running the gamit from the chic La Scala or Les Ambassadeurs to the more working class l'Eldorado or le Jardin de Paris. The present drawing is one of the earlier illustrations of the café-concert that so dominates Lautrec's work. With characteristic simplicity, three people with a few props (wine glasses, fan, cane and unanimous hats) create an immediate ambiance of the noise, bright and convivial atmosphere of the dance hall. It is possible that the female figure in the middle is the clownesse Cha-U-Kao known from inummerable Lautrec lithographs. Perhaps the woman on the left is La Goulue: two entertainers catering to their moustached bourgeois client with his top hat and cane. The gloved hand on his pointy chin add a note of intimacy and vague condescension. 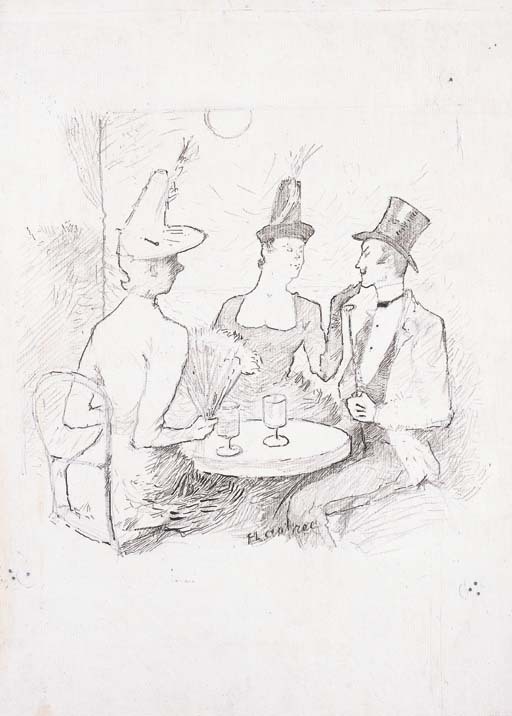 Café-Concert à Montmartre is related to two drawings, both entitled A Montmartre, in the collection of the Musée Albi. The first is a charcoal sketch (D.2970), the other a pencil drawing (D.2969). Both are less finished than the present work with its touches of colour and incisive line. Two years later, Lautrec would employ the same composition of three figures at a table for the 1888 painting en grisaille, Le Bal Masqué (D.P.302).